The income tax's legal battle is just beginning. To no one's surprise, a King County Superior Court judge on Wednesday struck down Seattle's income tax, ruling that the bill slated to start in 2019 is not an "excise tax" and therefore violates state law. The ruling marks the start of an appeals process that will likely take the case all the way to the state Supreme Court. The city will have to appeal the decision to the Court of Appeals first. Judge John Ruhl's decision, which favored the four different groups of plaintiffs suing the city, made it clear the Superior Court wouldn't touch the question of whether the tax is a constitutional violation and ruled based on state statutes. Ruhl cited four state laws in his order—and he said that the Economic Opportunity Institute, a defendant who helped create the tax with the city and has long fought for a statewide income tax, didn't prove beyond a reasonable doubt statutes created by the state legislative branch violated the state constitution. "Where an issue may be resolved on statutory grounds, the court will avoid deciding the issue on constitutional grounds," Ruhl quoted from a 2000 court case. "The court has determined that no statute authorizes the city's net income tax and that RCW 36.65.030 prohibits the tax." 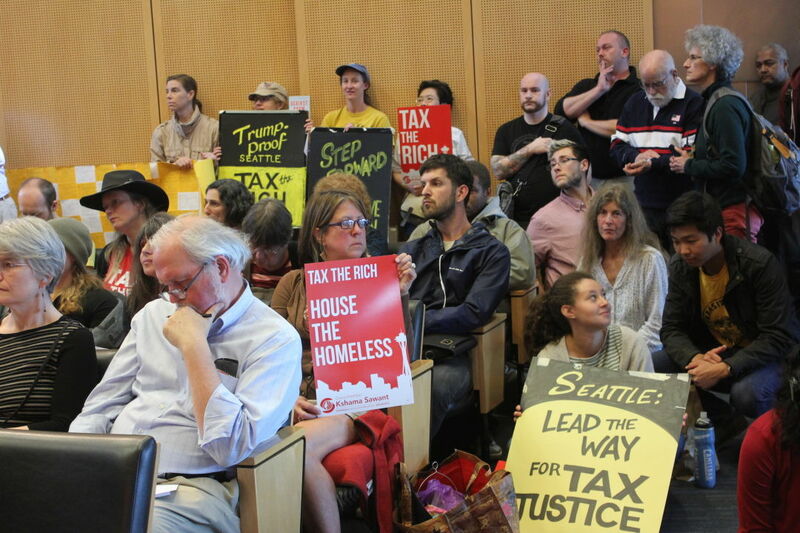 Seattle council members in July unanimously passed the city's progressive income tax as a potential path to correct what's long been considered the most regressive state tax system in the country, according to the Institute on Taxation and Economic Policy. (The lower the income, the greater percentage you're paying into taxes.) A study using 2015 data showed the poorest 20 percent of the state—less than $21,000 in annual family income—pays 16.8 percent of their income taxes. The most wealthy 1 percent—$507,000 or more—pays only 2.4 percent. The Washington Supreme Court back in the 1930s narrowly ruled that an income tax was unconstitutional and substantially limited local governments' ability to propose new revenue beyond sales or property taxes, which disproportionately affect low-income households. The city has also already enacted a business-and-occupation tax on corporate income. Community organizers involved in the legislation hope to eventually push the income tax statewide, which has long been an unpopular initiative; voters have struck down income tax measures eight times. The last time it was tried in 2010, 64 percent of voters opposed it, though activists and city officials have said they believe there would be more support for it now. Seattle's income tax, a 2.25 percent tax on income above $250,000 a year, would generate $140 million a year in revenue for the city by 2019. But it also required the city to invest in its own infrastructure to begin tracking tax returns—an estimated $10 million to $13 million one-time cost for the IT system before Seattle would collect any revenue. After that it's an annual cost of $5 million to $6 million to fund up to 50 new city employees for IT and enforcement. -Two state statutes specifically allow cities to enact excise taxes—excises for regulation (in 1967) and a list of specific powers cities can have (in 2011, number 32). -Law on the powers cities have includes options like fixing compensation and working conditions, maintaining civil service or merit systems, and creating retirement or pension systems. -A law that prohibits local governments from taxing net income.